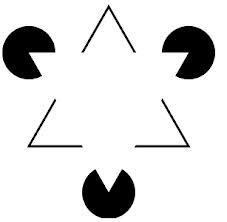 Sometimes we only see a part of the picture but sub-consciously complete it using our assumptions, leading to a correct or often an incorrect completion of the picture. Being conscious of this process is really powerful in understanding how we make sense of the world. It enables us to challenge the lens through which we view situations and gain different perspectives which can then inform our decisions. 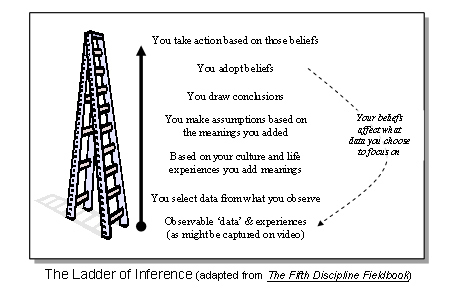 To help with understanding this, I would like to share a model developed by Chris Agyris and Peter Senge called the ‘ladder of inference’ which a colleague reminded me of recently (thank you Annick!). Imagine an interaction between two people. At the very bottom of this ladder, we consider the ‘observable data’. This is the data that a video recorder would record if there in the moment. It is the solid ground on which the ladder is positioned. From this data then, we select the a sub-set of data that we believe is relevant to us and this will be different for all of us. No doubt we all have recollections of conversations where different people remember completely different things from a meeting. The data we notice is that which typically fits with our views of the world. It helps to simplify the situation so we can make sense of it. At this stage as we can see, we are already restricting our data-set and seeing a narrow view of the reality. From there we add meaning based on our personal history, experience culture etc. and then this is where we start to make assumptions. As we go up the ladder further we see that this leads us to drawing conclusions based on these assumptions and ultimately taking actions based on beliefs (which are often times firmly held). So we go from the solid ground of observable data, up the ladder of inference and end up with firmly held beliefs which are based on restricted data, meaning being added, assumptions being made and conclusions being drawn. This process is crucial to us not being over-whelmed when trying to make sense of situations. We do this on auto-pilot. What has been really interesting for me recently is to walk through this ladder to understand where my assumptions went astray almost in slow motion. What part of the picture was I not seeing? What meaning did I add based on my personal history that I need to re-think in the future? All of this can help us understand the lens we use to view the world and how we might broaden our perspectives. Once again in my opinion, the greatest learning comes from situations which are not neat and orderly, but those that challenge our thinking!